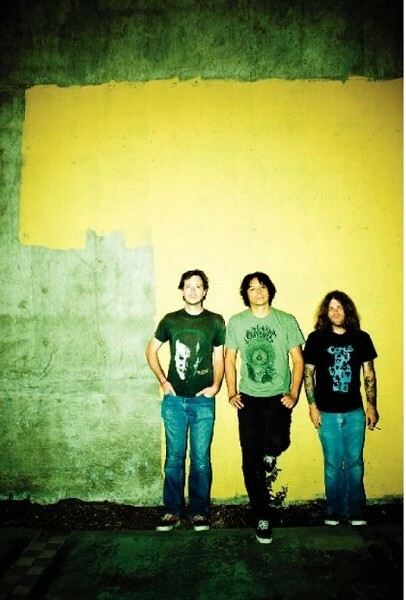 The Big Bang: Earthless’ psychedelic rock travels into wild dimensions. When performing live, the members of Earthless communicate through a concept called “cosmic nodding.” According to drummer Mario Rubalcaba, the practice involves the three players scanning one another’s eyes for movement to denote a change in tempo or passage. As Earthless crank out sizable, improv-rich instrumentals with no room for breathers, these subtle exchanges are necessary to keep their psychedelic jams afloat. Seeing how the process seems to be built on unspoken instinct, putting it into words might be difficult. “I’m not sure if I explained it too well. I don’t know if it makes sense, but it makes sense to me,” he adds with a chuckle. By their third get-together, Eginton devised the name Earthless, taking inspiration from a track by ’60s garage/ psych-rock bunch Druids of Stonehenge. The moniker stuck and the project was officially underway. With the intimidating prospect of a possible hour of improvisation looming before each set, does Earthless do anything to prepare for performing? “Honestly, no. To some people’s surprises, we’re not a big stoner band and we don’t get wasted before we play,” says Rubalcaba, feigning an “‘Oh, let’s be on acid!’” As a substitute, the drummer’s pre-playing routine involves a half-hour of stretching to compensate for his lack of breaks. “That whole endurance rock thing takes a lot out of you”.